Foxin Wins Again online slots casino game is the follow-up to Foxin Wins online slots casino game. If you’re not familiar with that one, it’s about a fox and in this follow-up slots game he’s aboard a luxury cruise liner called Foxy Lady with his family of fox cubs. Founded in 1999, this UK headquartered company, NextGen Gaming has offices in Australia and Sweden. Although it has been around a while its name is not as well known as other developers in the industry. Its focus is on business to business transactions so they market games which are customisable by other more well-known companies. Foxin Wins Again slots has a 5 reel, 4 row, 50 fixed payline format. At the bottom end of the paytable are the usual playing cards, then there is a compass and a cocktail, the foxy lady cruise liner, and at the top of the paytable, Foxin relaxing on the deck of the liner. Click I to view the rules and the paytable. Place your bet using the up and down arrows (from 0.01 to 1.00), or click Max Bet if you want to bet the maximum you can. You can play auto by clicking the Autoplay button and choosing a number of spins from the slider and clicking Start. You can stop autoplay at any time by clicking Stop at any time. FOXIN AT THE SHIP’S WHEEL – substitutes for all symbols but the scatter. SHIP’S BELL – three or more trigger ten free spins. Spin two or more to win a multiplier of your line bet. Triggered by three or more scatters, you’ll win 10 free spins. During the free spins, the fox cubs jump on the reels more often than during the main game, giving you more wilds and therefore more chances of winning combos. And you can trigger more free spins if you spin up three scatters again. At the end of your free spins you get to take what you’ve won or take the ten free spins again. This adds an amount on top of your bet and increases the number of wilds in the game. At level 1 you’ll get wilds on reels 2, 3 and 4 and at level 2 on reels 1, 2, 3, 4 and 5. The wilds can become stacked and a fox cub will randomly jump on the reels and award one more wild. After a win, for a limited time you can gamble your winnings by choosing a black or a red card or a specific suit. If you win you double or quadruple what you have just won but if you lose you get nothing. 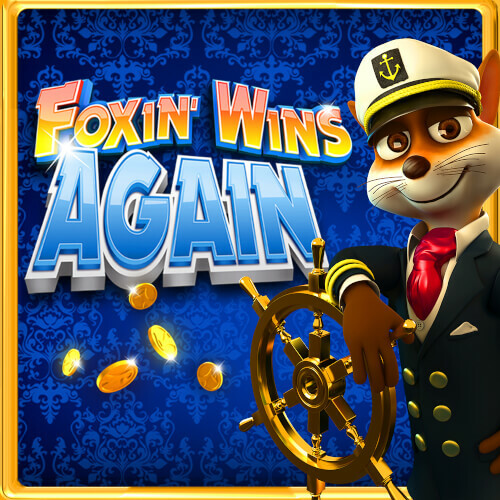 Foxin Wins Again slots online casino game is a fun game with good graphics and unusual bonus features.